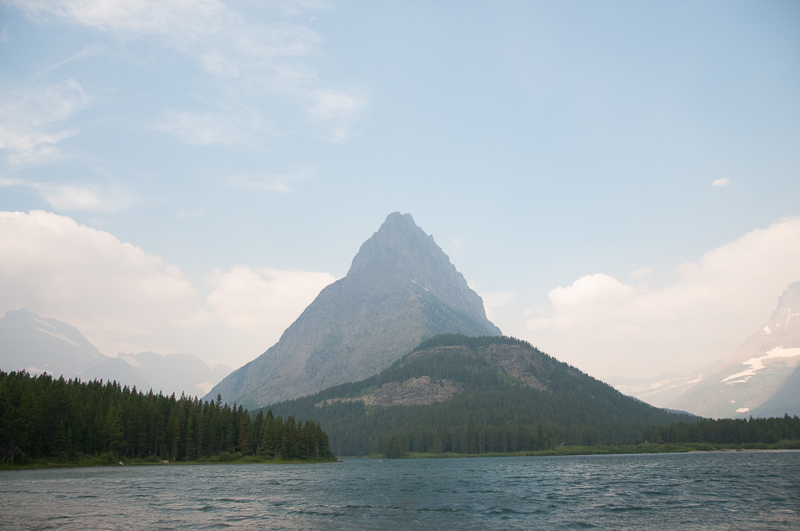 July 20, 2014 There is a boat tour that leaves from the Rising Sun boat dock and crosses St Mary Lake, taking passengers to Baring Falls (above) and, if they are interested, on a National Park Service Ranger-Naturalist led guided hike up to St Mary Falls. 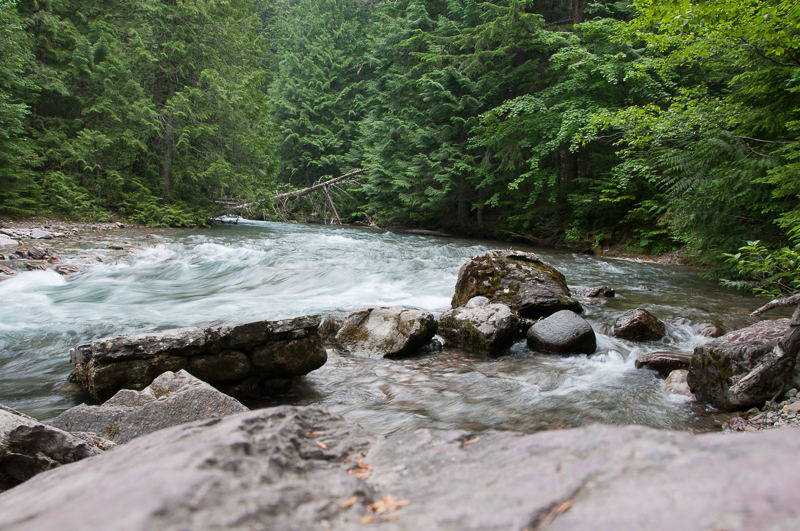 We decided to take this three mile ranger led hike to St Mary Falls for the safety-in-numbers factor, and also to learn more about what we were seeing and experiencing. It turned out to be one of the highlights of our entire vacation, in my opinion. The boat ride starts out with a guide explaining the various points of interest along the way. 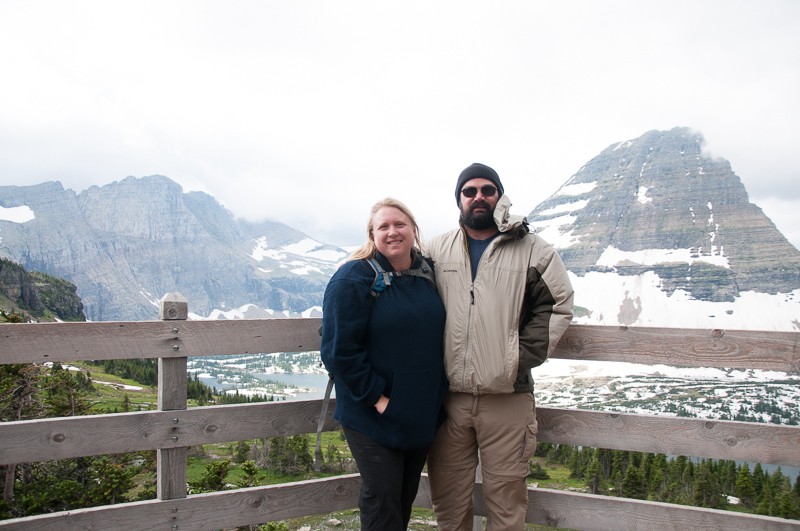 There were several interesting features along the way, including Sexton Glacier and Wild Goose Island. I was most fascinated with this bit of rock, though, that I am looking at in the picture below. 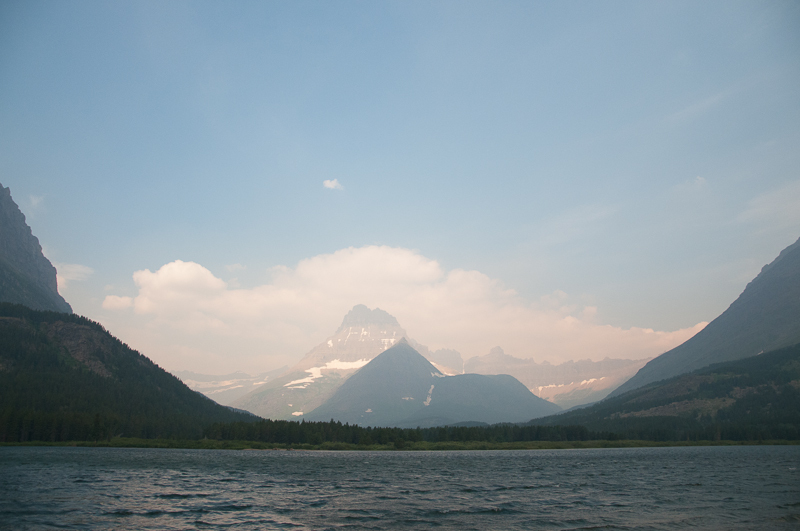 GNP contains some of the oldest rock in the world, and this rock was told to be about 1.5 billion years old. The rock existed before there were plants. No fossils are found in the rock beds, even though most are sedimentary rocks. The reason for this is that the rock was set before life as we know it began – even before algae, simple plants, before complex plants and animals existed. Before this area was a mountain range full of (quickly receding) glaciers, it was an ancient sea. This also mystified me, how a place can go from one extreme to another, and how geologic time is so unfathomable to our human brains, who have a hard time understanding how little time we have occupied in the grand scheme of planetary age. At some point along the ride, this guide stopped pointing things out and introduced Ranger Jackie. She stood up and for a few minutes, I thought she was a junior ranger of some sort. Surely she was still in high school? When she started talking, though, it became apparent that she was just a fully-matured woman, just diminutive in stature. It didn’t take us long to become fans of Ranger Jackie. 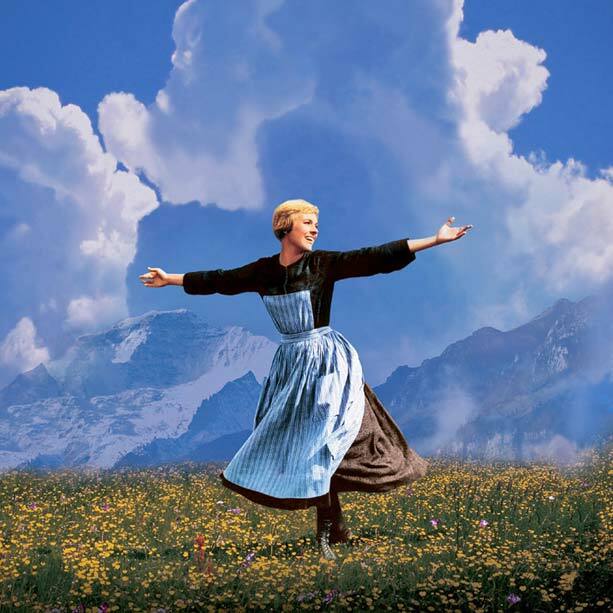 She was incredibly k nowledgeable. She seemed to know the names of all the plants and wildlife we encountered. 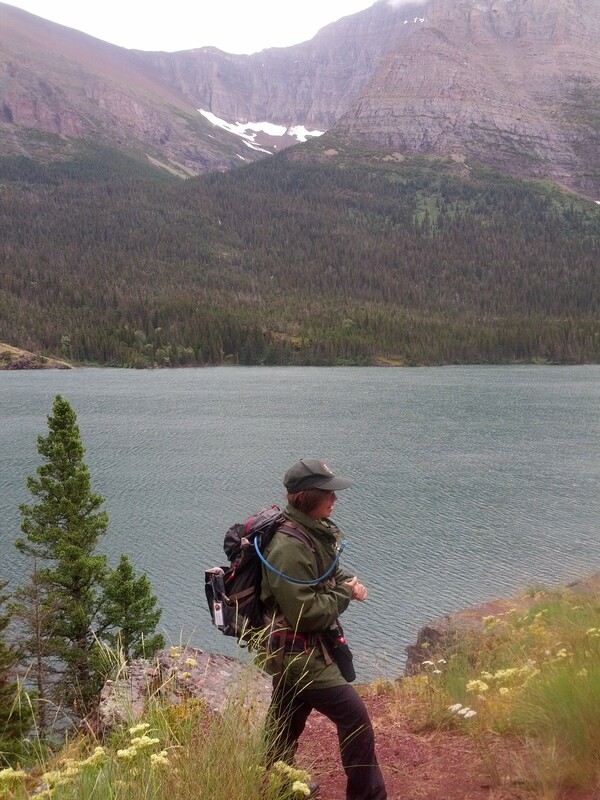 I think I want to be like Ranger Jackie when I grow up. After our short visit to Baring Falls, she took the six of us who wanted to go on the extended hike to St Mary Falls, giving us a talk along the way about how the four elements of nature (air, water, fire, and earth) have worked in concert to create what we were seeing around us. Along the way, she regularly would call out i n musical-like fashion “Hey bear”. This was not to greet the possible bears along the way, but to let them know we were there, so they would share the “road” with us and not be surprised by hikers, which is usually when trouble begins. I felt a little shy about calling out “hey bears”, but if she wasn’t doing that, I would have made sure we were making lots of noise. Along the walk, Jackie shared with us that she had been a park ranger for five seasons in Kenai Fjords NP, in Alaska, before this summer. When I told her I wasn’t familiar with that park, she said that if you saw a picture on the internet of bears fishing for salmon in an Alaskan river, it was probably from that park. She was known this summer as a bear specialist. 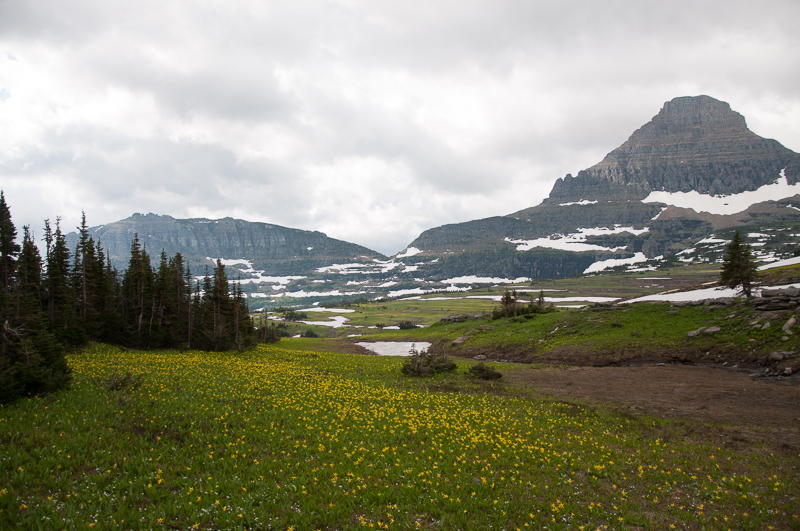 Soon after we left Glacier for the summer, I heard a story about a hiker from Texas who was hiking alone and surprised a bear on the trail (maybe a lack of “heybears” on his part?). The bear charged him, and he used his bear spray initially, but either the bear wasn’t stopping or he didn’t trust the spray, because he ended up pulling out his handgun and shooting the bear. The bear was injured and ran off into the woods. The hiker then reported the incident to a ranger on the trail, and soon the rangers and “bear specialists” were spending nights and weekends looking for this injured bear. I thought of Ranger Jackie when I read about this, wondering if she was one of the ones out looking, and who she sympathized with the most. 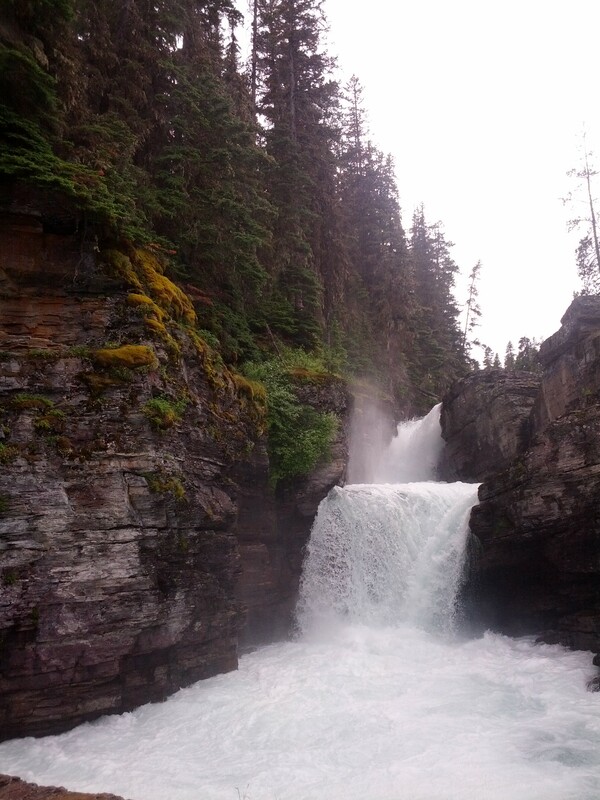 St Mary Falls seemed sublime in its force and power. 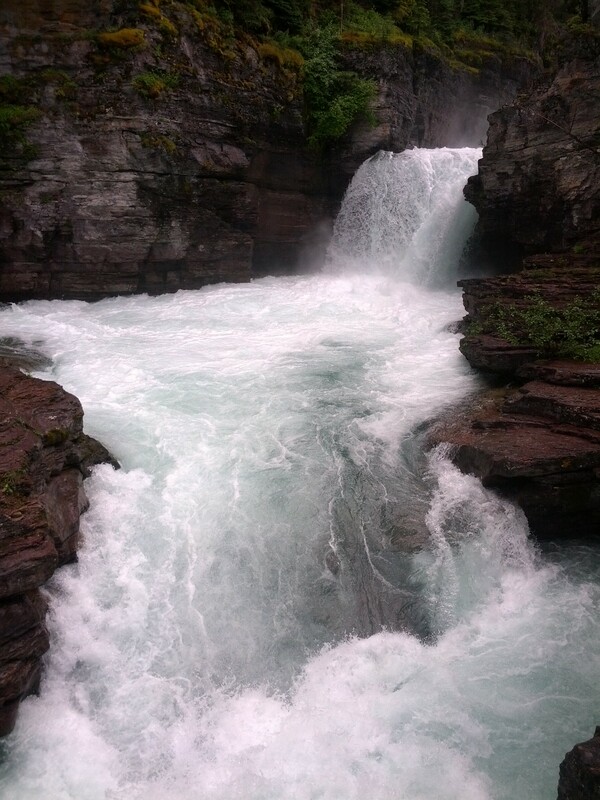 I thought about a lady Jackie told us about in caution, who had lost her life in a river in Glacier just recently because she stopped off the trail to get a better picture of a waterfall just like this, and fell in. 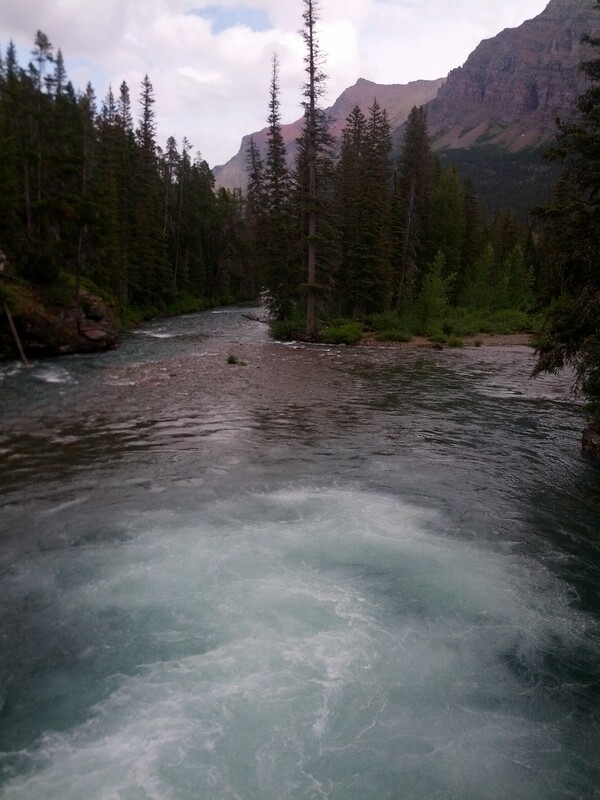 I would not want to fall in these icy, swiftly flowing waters, although the cool blueness was enticing. By the time we were leaving this waterfall, it became clear that Jason and I were both clearly in “Team Jackie”. There was a moment even when I walked up to the two of them where I could have sworn, in another reality, that he was flirting with her. I know he doesn’t have any game, though, (laughing), and even if he was, it was innocent and I don’t really blame him. I would have flirted, too, and in the end it probably would have paid off more for me, since we both came to the impression that she was “playing for the other team”, so to speak. I realized, though, what it was that we liked about her: her intelligence. I have decided that Jason and I are probably both saphiosexuals – one that becomes aroused by intelligence and its use – and that this one thing, above all others, is probably what drew us to each other. As much as I am attracted to him, it was his mind, and mine, and our early intense conversations that really sparked the flame between us. Jackie was smart, confident, and outdoorsy, and in the end, we both like people like that. We still think about her fondly. 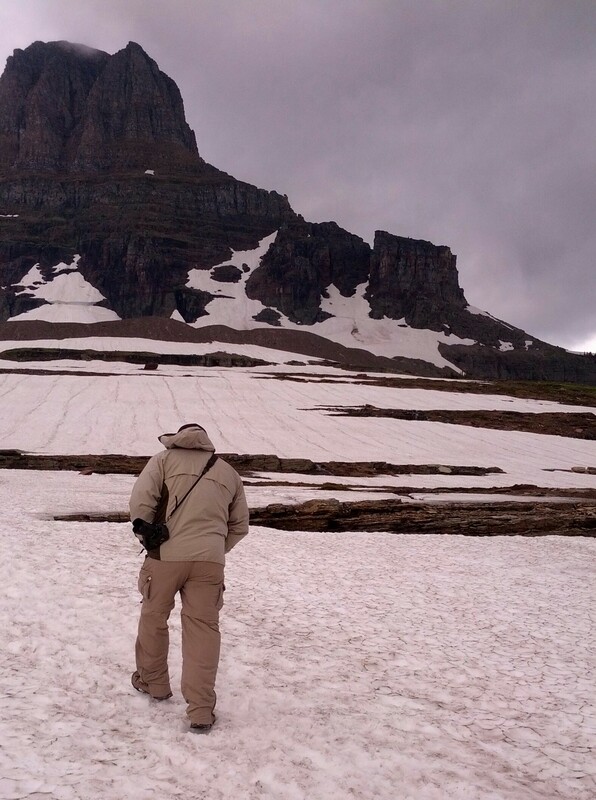 After our two ranger-led hikes in Glacier, I have decided that I am pretty much a fan of ranger-led hikes, because I love the education that you get. I wish I could bring a ranger with us everywhere we go, particularly one this fascinating. I am going to make it my goal to seek out more experiences like this at the parks we go to. 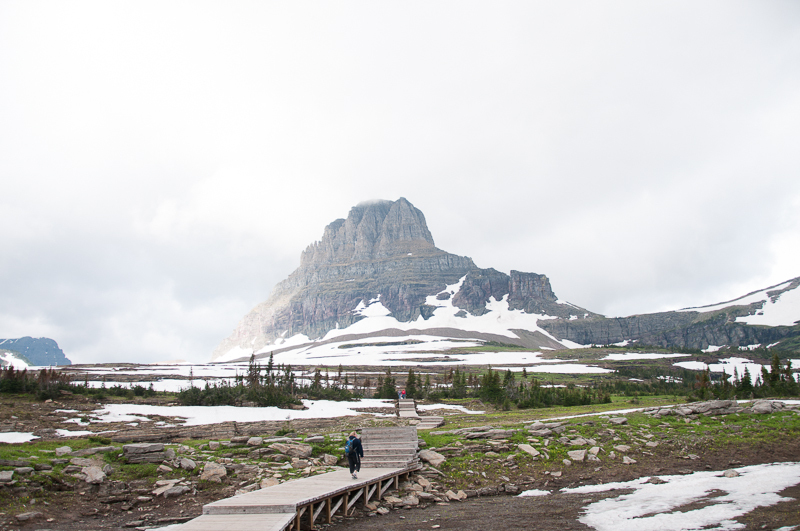 On our last full day at Glacier, we decided to head out to Logan Pass and take a short, popular hike to Hidden Lake. We knew there would be plenty of other people walking this same trail, so 1) it seemed safe enough to travel in twos and 2) we should get there first thing in the morning, as the travel books say the parking lot is typically full by ten am. So the “easy three mile hike” to the overlook and back took us much longer than anticipated. 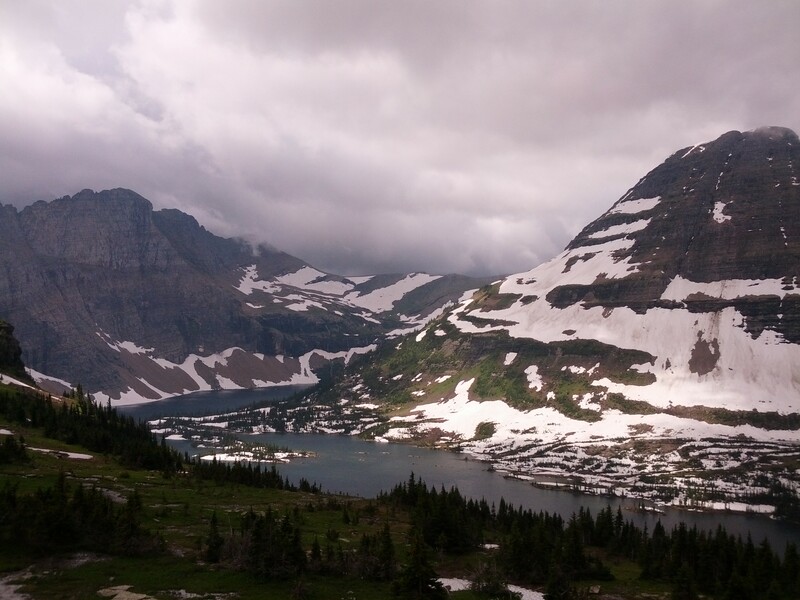 If you went all the way to Hidden Lake and back, it would be a six mile hike, but the trail was closed at the overlook due to bear activity. No one was going down to the lake today. 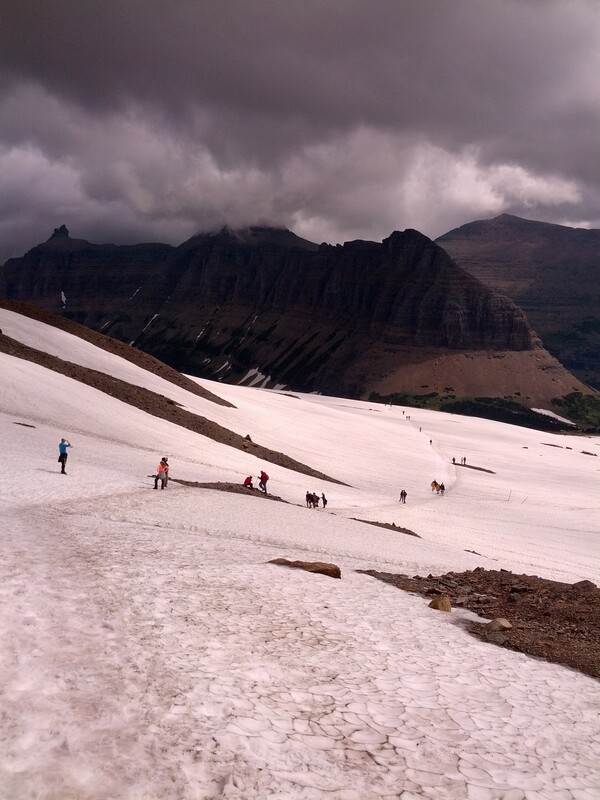 It was worth the slipping, sliding, and snow frustration for the view of the lake from the overlook, though. We encountered a bit of wildlife on this trail. 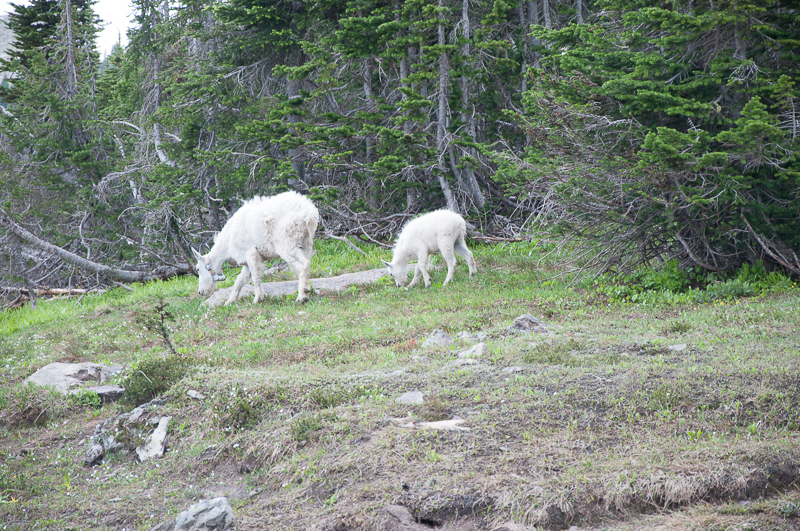 There were a handful of mountain goats, including a couple of cute, cavorting kids. 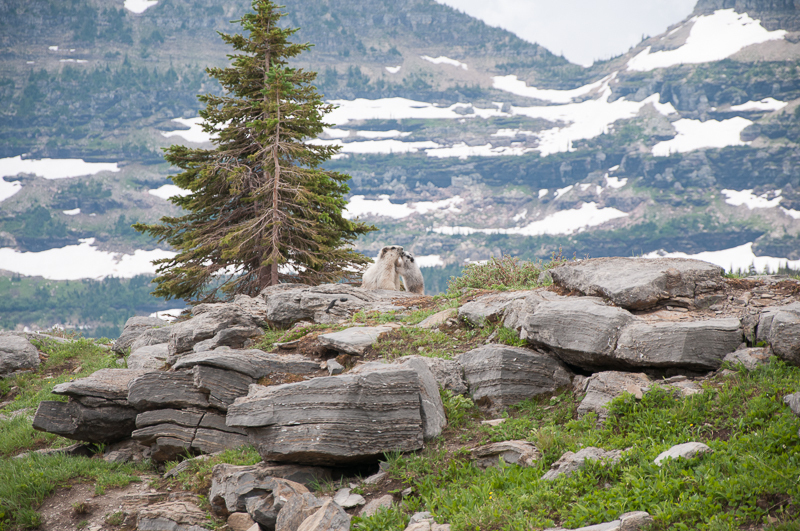 We witnessed a momma-baby kiss between hoary marmots. The people were interesting. Some were more prepared than we were, in hiking boots and maybe a smaller pack, but some were dressed in shorts and flip-flops, which I thought was completely crazy. I think if I was dressed like that and saw the trail, I would turn back around and come back when I was more prepared. One lady was walking along the trail, near where these little streams were, looking down at her phone and not even looking ahead of her. 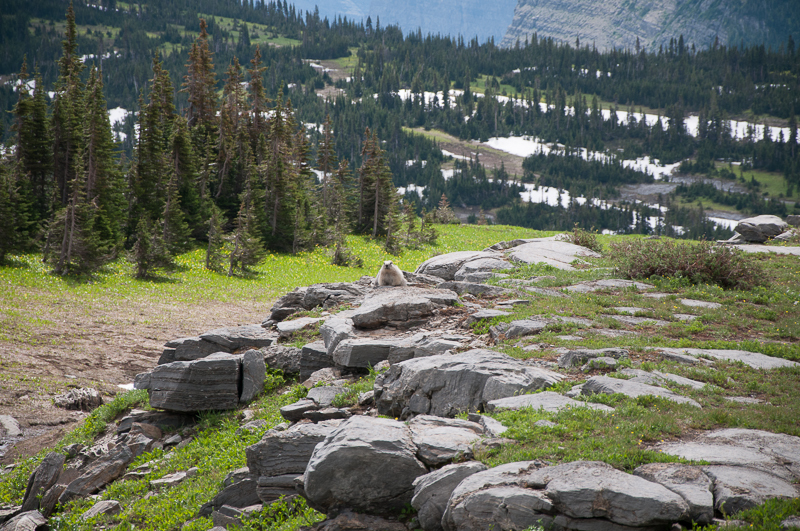 A mountain goat was walking straight towards her, completely unperturbed by the impending collision, most likely certain the person would yield the right of way, but it started to seem like she was not even going to look up until I got her attention and pointed the goat out to her. Good thing it wasn’t a bear, I suppose. How could one help but look up and around them, with these stellar views all around? There’s a time and a place for technology, but there is also a time to put it down and have an experience. Although I enjoyed our experience, I think I would have liked it better if it was later in the season and there was less snow. It seems like we are always a month off of the best season for everything when we go on these road trips. I think some part of it is because we are planning our trips around times when the kids are with their dad, at least part of the way. At least that seems to be the reason why we are always heading west instead of east. However, we aren’t going to keep going out of our way like that unless their dad starts keeping up with child support, so we’ll see where the road finds us next vacation. 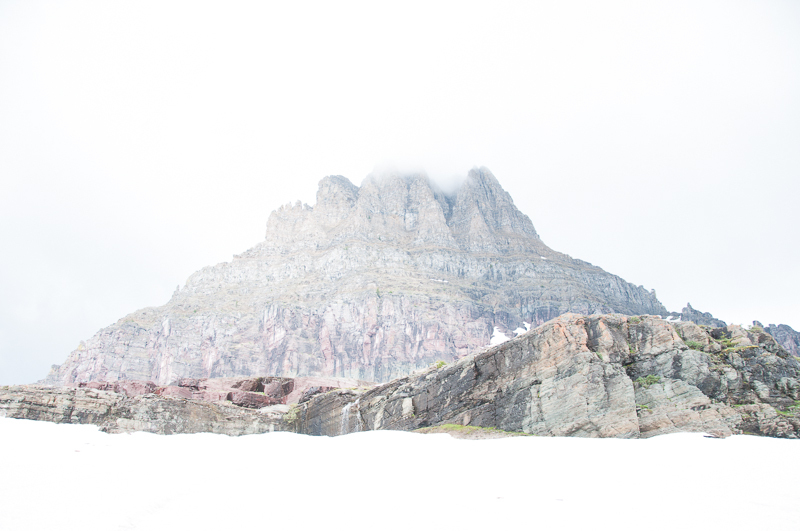 Glacier was one of those places I always wanted to see, though, kind of like some of the other iconic national parks we have visited together, and even though we didn’t get to see it all, we did get a sampling during this trip. This was not even the last stop of the day. 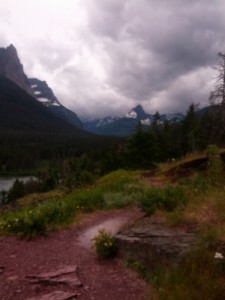 In the next post, I will talk about the St Mary area, and some of the waterfalls we visited there, after enjoying some huckleberry ice cream at the local souvenir shop. Also, there was a special show that we attended later that night that was a highlight for me of the whole vacation. Stay tuned.! 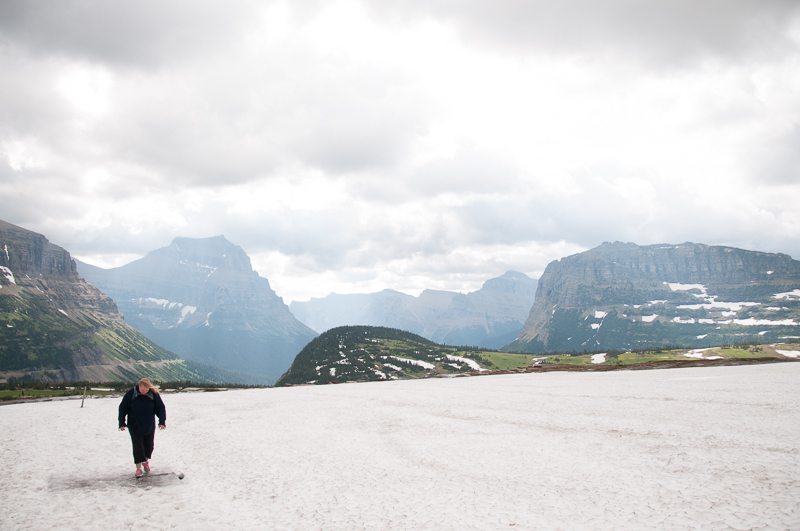 At some point while visiting Glacier, one has to make a choice. 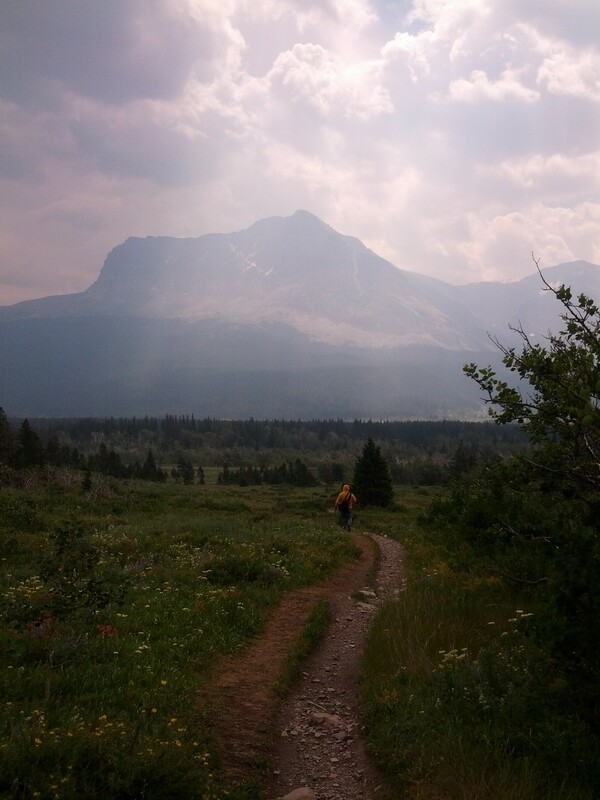 It would take probably a whole season, a whole year, maybe even a whole lifetime to see the entire 1583 square acres of this park, or to visit all of the 700 miles of trails, or to visit all seven sections of the park. In our case, I had made some choices for us, based on reading booklets about the park and deciding what was most feasible for us. Or course, the plan was more ambitious than we could handle, and of course Jason talked me into scaling it back. He told me that his back was hurting and he didn’t think he felt up to a hike of the lengths I had planned, but then later told me it was just an excuse because really he was worried about my ankle. I am not sure which of these I believe, but he did seem to be having more trouble with the altitude than we expected. Also, there were the bears. My mind had already wrapped itself around the bear problem, but I also had done a lot more reading prior to this trip than Jason had. When we stopped at a sporting goods store in Kalispell on the way into the park to buy bear spray, all of a sudden it got real for him. (Plus, he kept questioning the necessity of this $40 spray, and if it would really be effective). One of our weaknesses was the fact that it was just the two of us, since hiking in a party less than three is not considered necessarily safe. 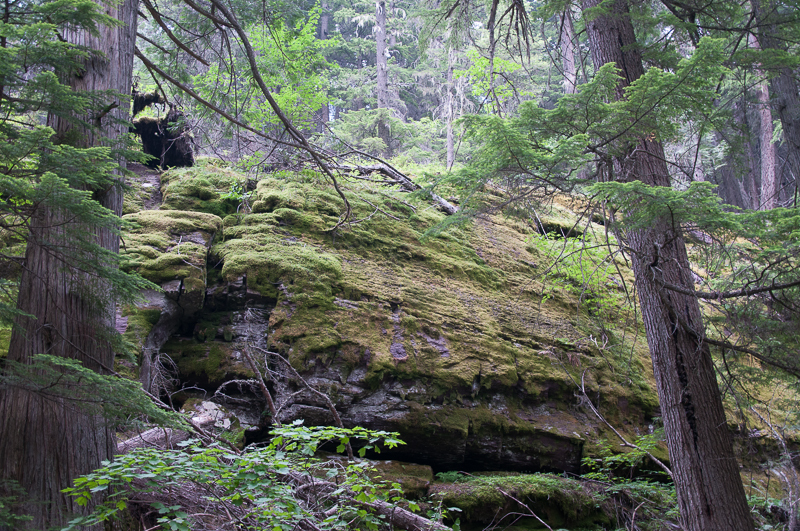 The bears have not tried to attack a group of three or more hikers at the park. This weakness was probably the number one reason why I conceded to his logic in making our plan for our first full day in GNP. 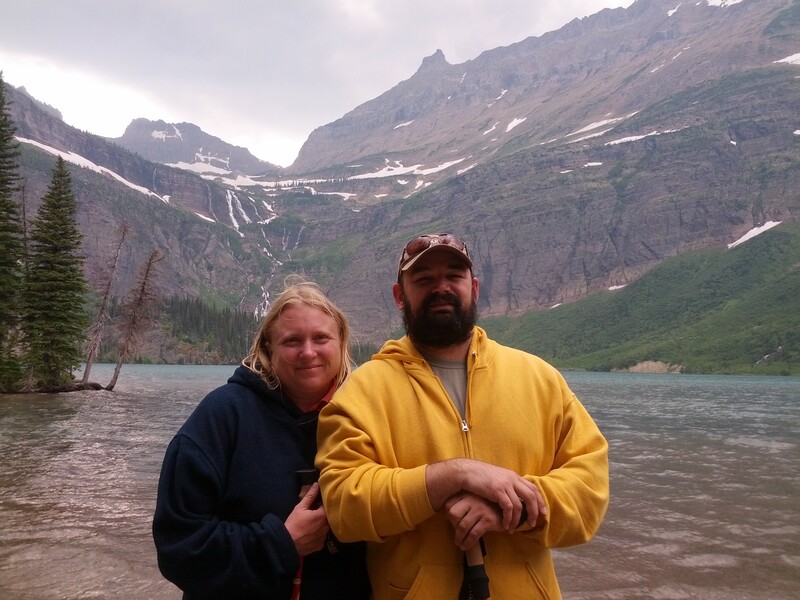 After some discussion, it became clear that Jason thought we should pursue the safety in numbers strategy, and also play it safe distance wise, by joining one of the ranger led hikes in the area. 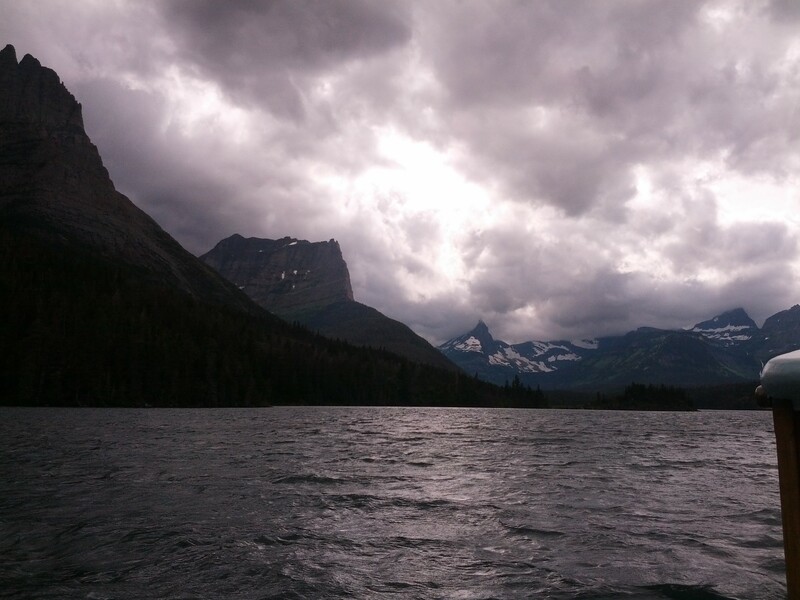 Given that directive, we chose to buy tickets for the boat tour that left from the dock behind Many Glacier Lodge, and take the optional short (1.5 mile) ranger led hike to Grinnell Lake. 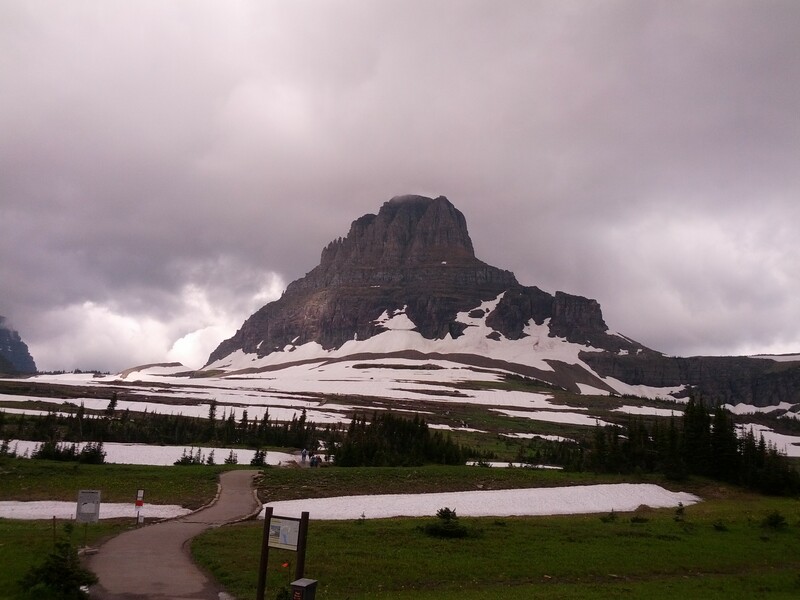 There is an early morning ride that one can choose that gives you the option of a longer hike to Grinnell Glacier, which I really wanted to do, but as it turns out, that trail was closed anyways (I can’t remember now if it was due to weather or bear activity). Jason didn’t think we should attempt a trail of that length (7.6 miles if you take the boat shortcut, eleven miles if you don’t). 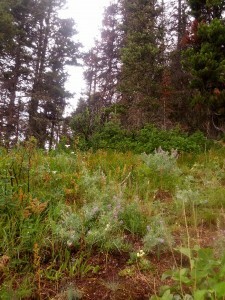 After reading a story of a recent bear attack on that trail in which a mother grizzly with cubs was surprised on the trail by two hikers (a father and daughter) who barely made it out alive, I am kind of relieved we didn’t pursue this option, although I can’t help thinking about what we might have missed out on. In the end, we made a compromise that worked for both of us. We drove to the old-fashioned swiss chalet style lodge in the morning and bought our tickets, but as we had some time before the ride started, we had time to walk around the lake on the Swiftcurrent Lake Nature Trail, an easy 3 mile walk that gave us some time in secluded beauty, but also felt somewhat safe, as we regularly came across other hikers. This made me feel like we were at least getting to see more than the short 1.5 miles with the group. Even thought we walked through what is known to be a moose habitat, we didn’t see any (although we were excited by the sight of a coyote in the woods on our drive in). We attempted to hike up to Apikuni Falls nearby, but the elevation gain (700 feet over 3/4 of a mile) did Jason in, and we turned around before we reached the falls. On the way back to the lodge from the trail to the falls, we saw a grizzly bear and her two cubs off a safe distance away. We were in our vehicle, and they were foraging in the grass at the edge of a woods in between the road and the lodge. There was a “bear jam” going on, of course, with everyone who happened to be driving by stopping at the edge of the road on both sides trying to get a picture or at least a good look. We got the latter, and not the former. We also saw a black bear by the forests edge on our way back to our campsite that night. These four bears were the only ones, out of the 750 in the park, that we saw during our trip. We ate a picnic lunch I had packed for us at a picnic table underneath shady trees while squirrels played around us, and hikers set off for points unknown from the nearby trailhead. There was this lady on a bike who was cracking us up. 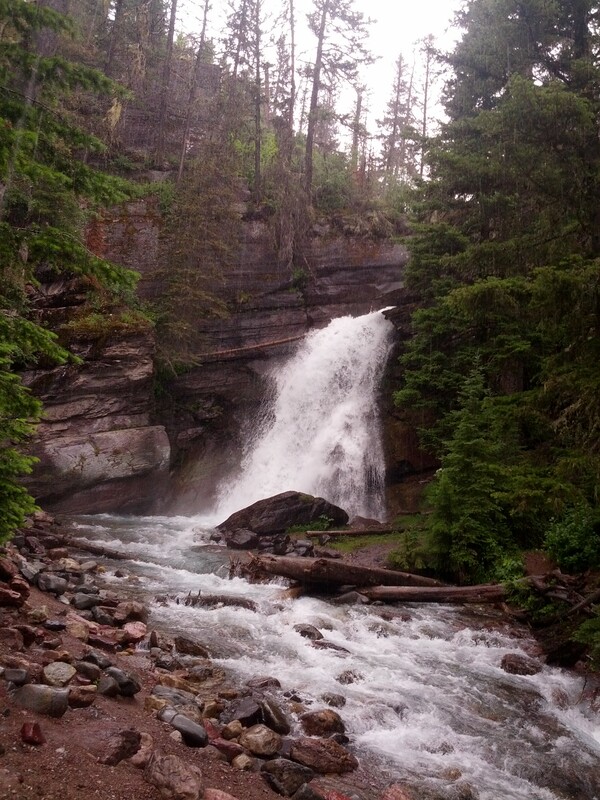 We saw her at the Apikuni Falls trail, and then again at this trailhead, and maybe again at the lodge. Every time we saw her, she was wearing a different outfit, and she had this little daypack with her. She looked worn and ratty but fit and intense, and she was just talking to everybody and joining in on groups. She was one of the characters from our trip we laughingly reminisce about, just like “Bear Bells” from our little walk to Grinnell Lake. 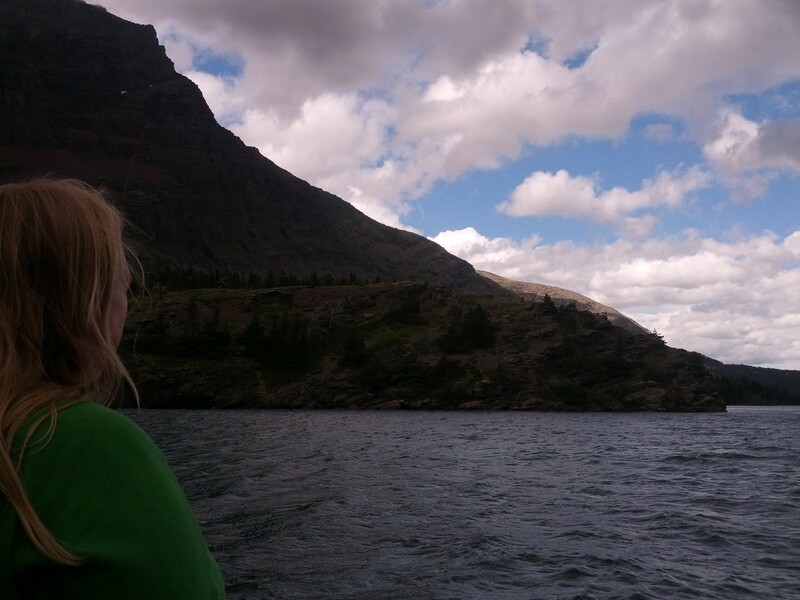 When it was time for us to take the boats to the ranger led hike, we boarded the Chief Two Guns that took us across Swiftcurrent Lake. The water was choppy and the little waves were fascinating. 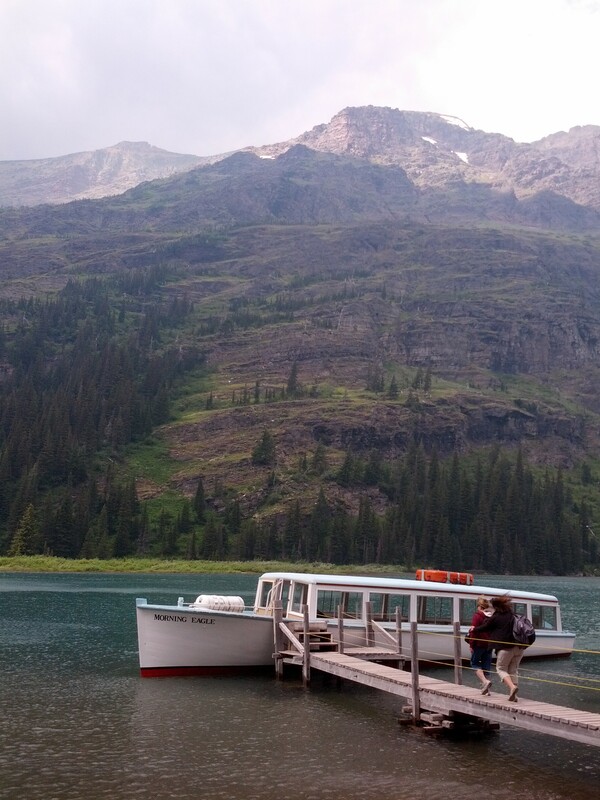 After the short ride across, we all left the boat and walked about 400 yards (with an elevation gain that took us both by surprise) to board a second boat, the Morning Eagle, which took us across Lake Josephine. After this, we had the 1.5 mile hike, led by Tom (we think his name was), who stopped every ten minutes or so to point out something special about the rocks or the plants. One highlight of the walk was the tension bridge that could only be crossed one hiker at a time. There was a great view of a waterfall that rewarded hikers if they were able to handle stopping in the middle of the bridge to look. 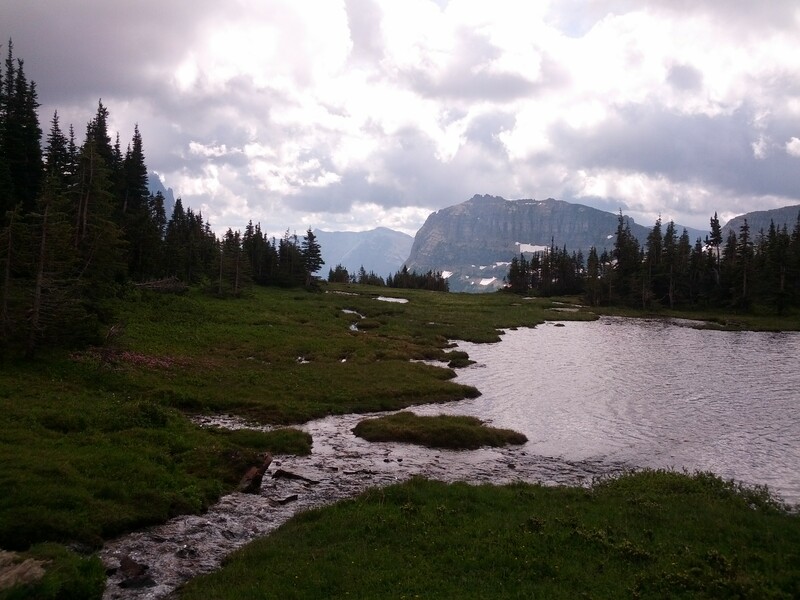 When we reached Grinnell Lake, he left us alone, and we all had some time to sit for a while and reflect on the lake, then make our way back at our leisure to the other end, where the Morning Eagle would come at a specific time to take us back. You could also walk to the waterfall if you wanted. 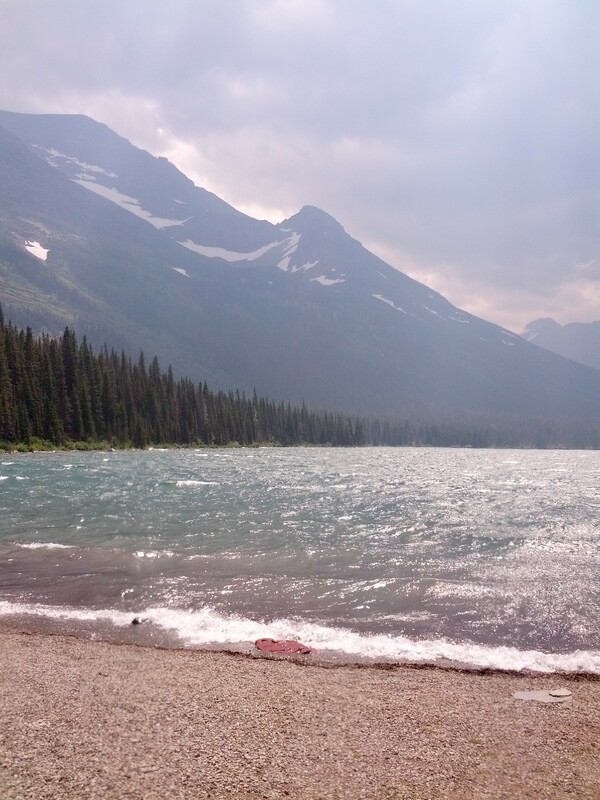 The water was absolutely beautiful in the lake, but very cold. I tried to wade in it but that did not last very long. 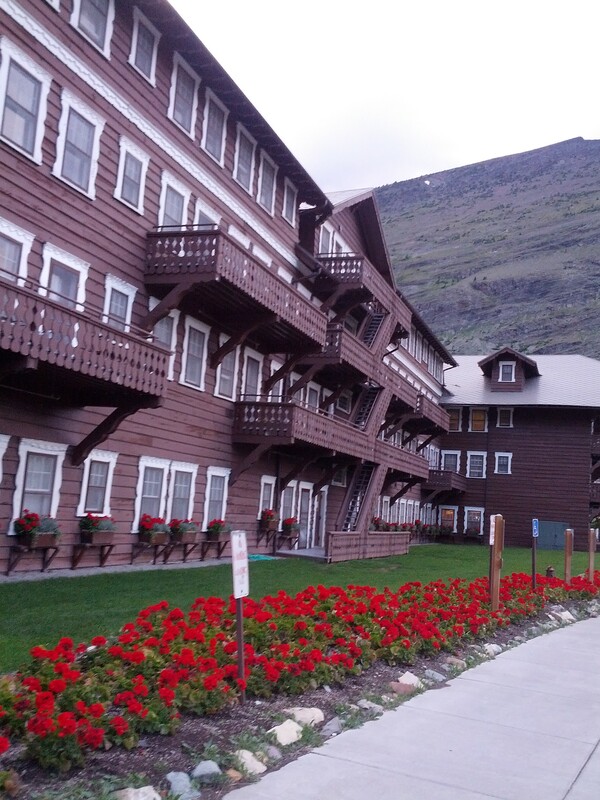 Before heading back, we spent some time inside the Many Glacier Lodge, hands hugging a warm cup of coffee bought at the little deli downstairs. Rocking chairs lined the porch, inviting guests to sit and watch a while. It was quite windy, though, while we were there, so no one was taking up the invitation. There was a gift shop with some fancy souvenirs in there. The lodge itself on the inside reminded me of something out of The Shining. I think it was the old style it was built in that made it a little creepy to me, although it was fun to walk around in. I read a story on the information displays in the main level that has stuck with me about the engineer that was tasked with finding a pass to build the railroad through up here in the late 1900s. It was an amazing feat, culminating in a night where he walked up and down a short track he made in the snow in his snowshoes to stay alive in 17- cold just before finding the pass, while his Indian guide nearly froze to death at the campfire he had left him at, when the Indian refused to go any further. It made me realize what lengths the early developers had to to go through to open up access to the public to this area of the world. I am so grateful to them for their sacrifices, because this part of American is a jewel that everyone should take the chance to explore. 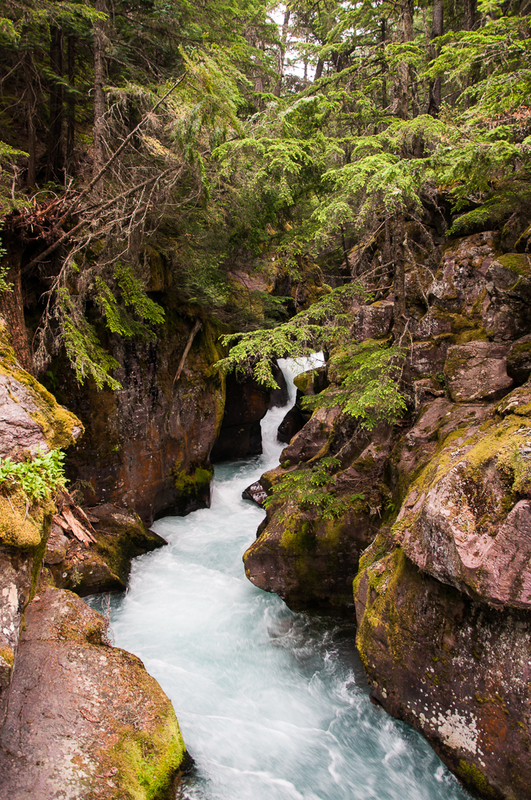 Avalanche Creek crashes through a gorge, just feet from the boardwalk that composes the Trail of the Cedars in Glacier National Park. 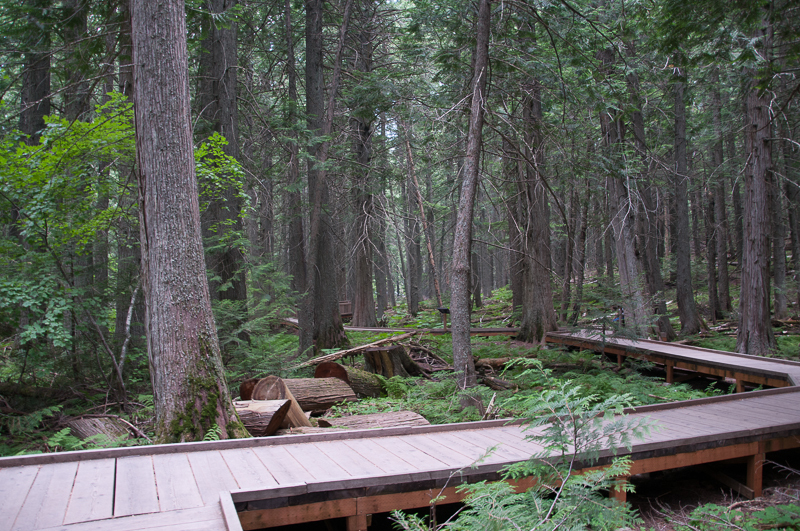 This trail is really a short stroll (0.5 mile) that takes a person through first a cedar forest, then a grove of hemlocks. 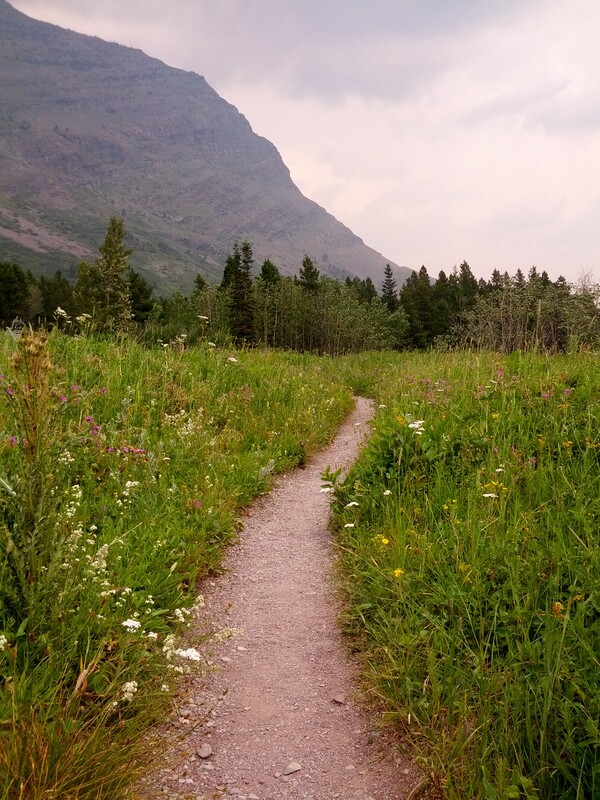 Even though it is a highly accessible, wheelchair friendly stop along Going-To-The-Sun Road that draws many visitors, it still is a peaceful interlude and offers much natural beauty to contemplate. 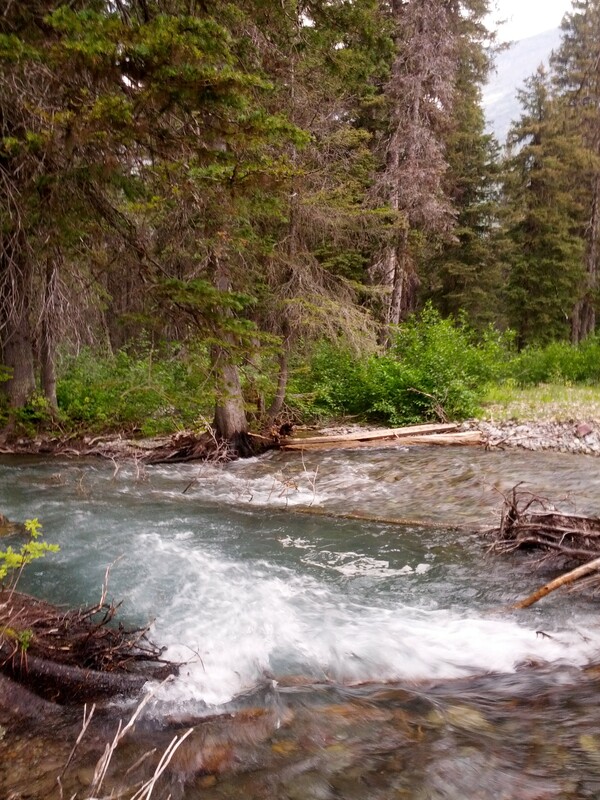 First the trail takes you past a quiet section of Avalanche Creek, in which the crystal clear water runs along gray and pink stones through the forest. 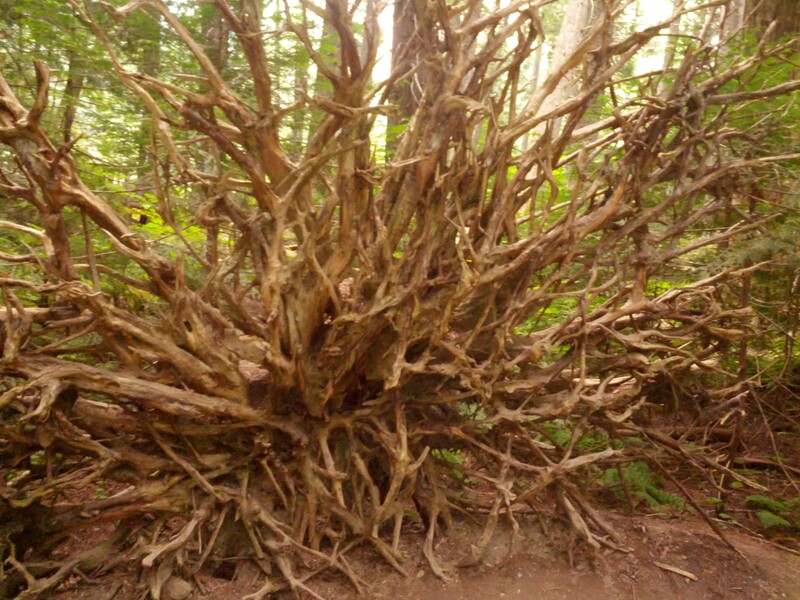 Then it leads into a forest area, where you see interesting trees, like the ones below. 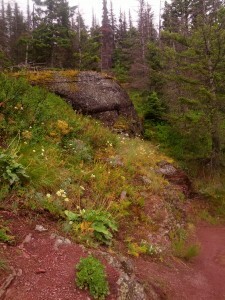 I loved the fern/moss combinations along the later part of the trail. 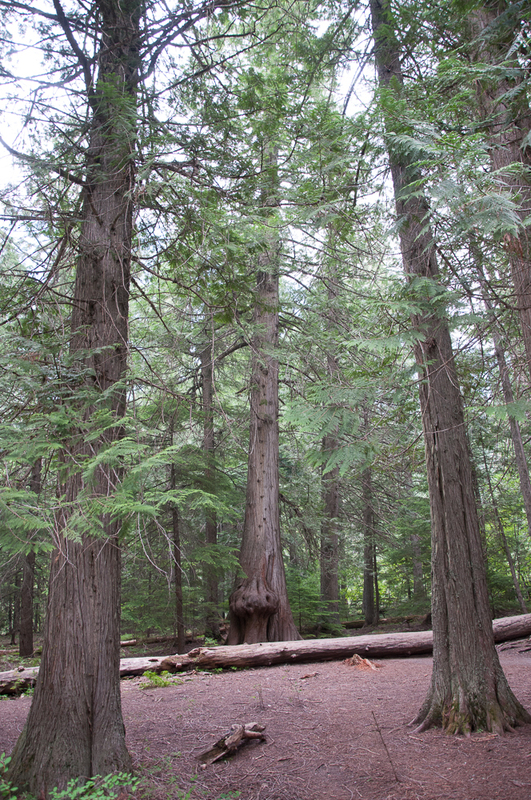 Soon, we reached an old hemlock grove. The most fascinating aspect of this grove is to think about all the history that has happened in America while these trees have stood here. The trees date back to 1517, and are approaching 500 years in age. Native Americans were the first ones to walk amongst these old trees, I imagine. They were already over 250 years old when the Declaration of Independence was signed. 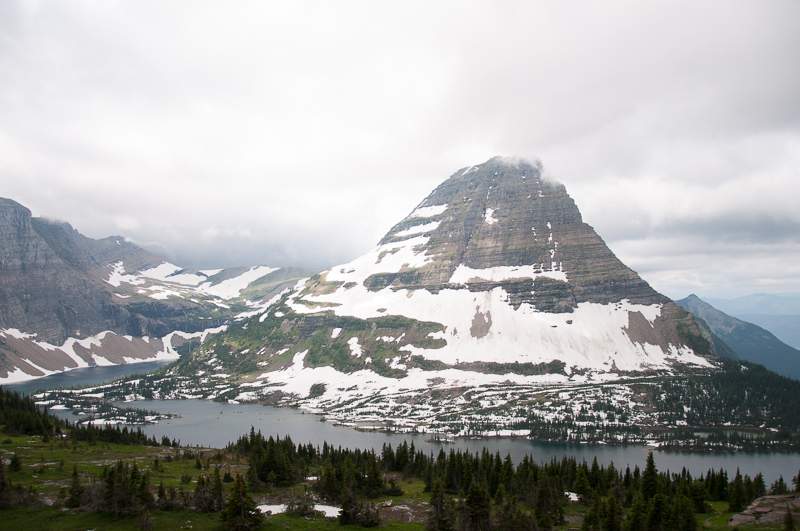 They were over 340 years old when this land became established as the Montana Territory, and almost 375 years old by the time Montana became part of the United States. 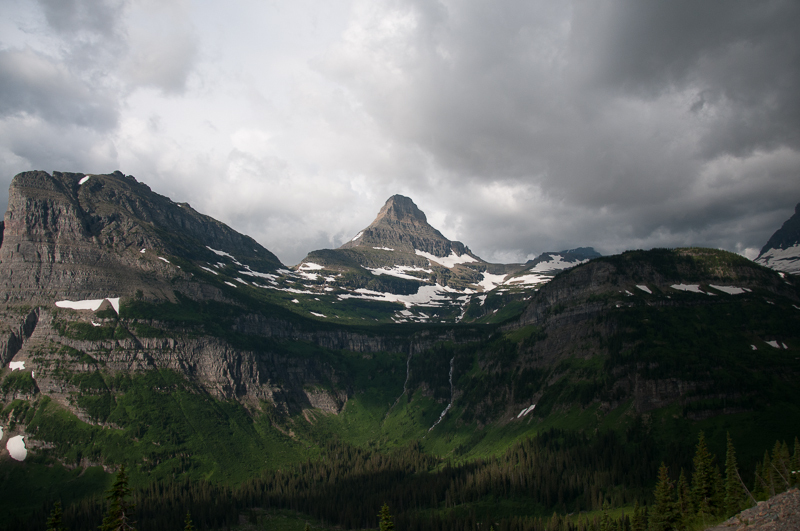 By the time the Going-To-The-Sun Road was paved just past the grove, these trees were already in their four hundredth year. You should come visit them. You won’t regret it.